Mark's Tickets is the best place to find tickets for Buffalo Sabres fans. Just check this page for any new events or schedule updates throughout the year. We sell tickets to every Buffalo Sabres game around the world. 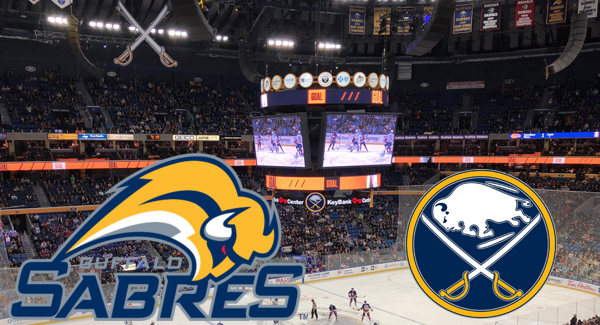 We know how passionate Buffalo Sabres fans can be about hockey, so we make sure to have hundreds of tickets for every game available right up until it starts. For those looking for cheap Buffalo Sabres tickets, we offer tickets starting at very low prices (many times below face value). We offer tickets in most sections of every venue that you can see Buffalo Sabres. Simply choose the city or venue that you are interested in below, and you will be able to see all of the available seats. Do not forget that Marks Tickets also specializes in sold out Buffalo Sabres tickets. No longer will sold out shows prevent you from seeing Buffalo Sabres. The Buffalo Sabres are a professional hockey team that plays in the NHL. The Sabres play their home games at First Niagara Center in Buffalo, New York. With 82 games per year, and 41 being home games, The Buffalo Sabres are a professional ice hockey team based in Buffalo, New York. They are members of the Atlantic Division of the Eastern Conference of the National Hockey League (NHL). The team was established in 1970, along with Vancouver, when the league expanded to 14 teams. They have played at First Niagara Center since 1996. The Sabres are currently owned by Terry Pegula and are coached by Ron Rolston. The team has advanced to the Stanley Cup Finals two times, losing to the Philadelphia Flyers in 1975 and to the Dallas Stars in 1999. The best known line in team history is The French Connection which consisted of Gilbert Perreault, Rick Martin and Ren? Robert. All three players have had their sweater numbers (11, 7 and 14 respectively) retired and a statue erected in their honor was erected at First Niagara Center in 2012. Tim Horton (2), Pat LaFontaine (16), and Danny Gare (18) have also had their jersey numbers retired.